Between Target and Nordstrom Rack, last week was pretty fruitful for me. (I'll post an end of the week recap with all my deals.) I didn't spend all that much but once again, post binge, it's time to purge. No bags this time (sorry guys) but I have a bunch of amazing shoe and clothing deals for you. My rules are simple; no resellers, US shipping only and yes, I combine shipping for multiple items. I've added a small (20% or less) mark-up to the prices to compensate me for my bargain-hunting time. (Prices also include shipping and paypal fees.) No returns as I'm not Walmart so know your size and ask questions as needed. Pet free, smoke free home. 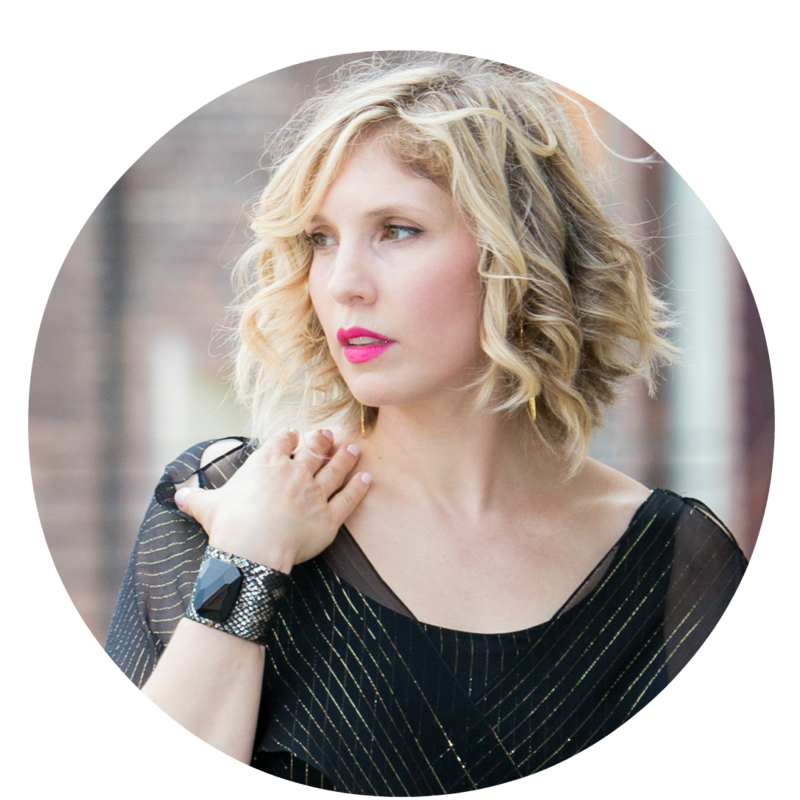 If you're interested in anything contact me here or on my Shoppinggalnyc Facebook page. So you saw this on Facebook and Instagram and I've decided to let it go here instead of Ebaying it. 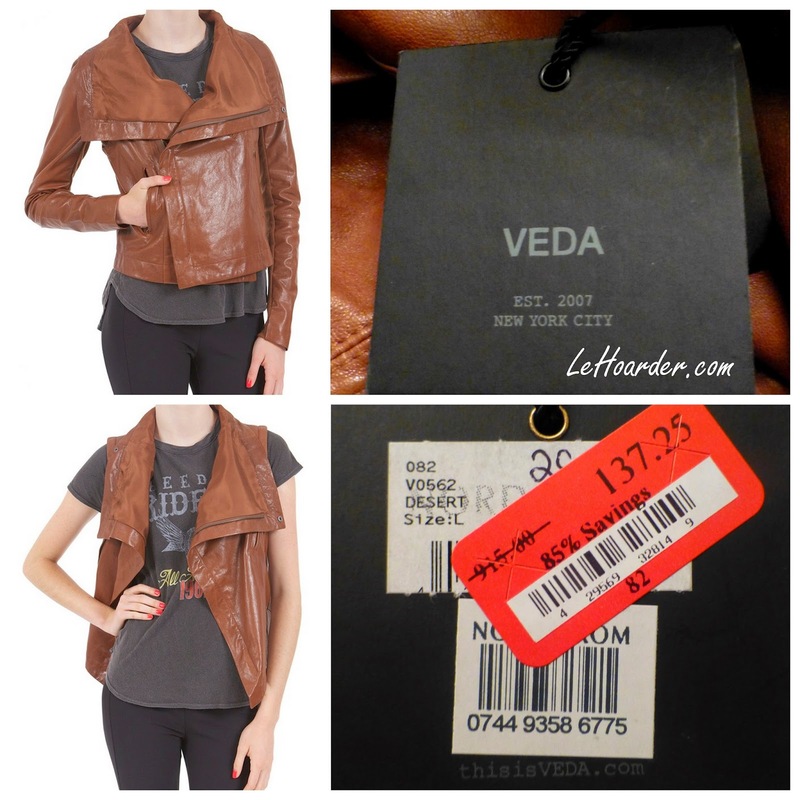 This Veda convertible leather jacket (arms zip off) in "Desert" brown is a size large. This jacket is butter! Veda tends to run small and this would probably work best on a 8/10. It was just a little too boxy for my taste - I like to show my waist now that I have one again. It has a few light marks but nothing serious. Measurements are as follows (when flat and zipped up); 20.5 inches long, 18.5 inches across at the chest, 18.75 inches across at the hip, arms are 25.5 inches long from the top of shoulder seam and 5.75 inches wide at the widest point (but have room as there is a fabric stretch panel that runs the length of the arm. Here is a picture of my gorgeous niece modeling the jacket. She's a few inches shorter and a size 4/6 to my 6/8. It was a little big for both of us. I actually just caved and sold her my $35 mint Rebecca Minkoff Mini MAC because she tried to go on the subway holding her wallet because she didn't have a purse. Next up are these shoes that you've seen before. I CAN'T BELIEVE nobody wants them because they are spectacular. Last call! Here are the size 36.5 refurb Valentinos, retail $695 - for $250 shipped! I never took a pic of the soles so LMK if you need to see one. And here are the size 39 Refurb Jimmy Choo Kaftas, retail $995, get these for just $275 shipped! Next up are a pair of brand new Rag and Bone nubuck Newbury boots size 40. I actually picked these up for a friend who was looking for a pair - but she ended up caving and already spent full price. Now you don't have to :) Retail $495, get these for $235 shipped! 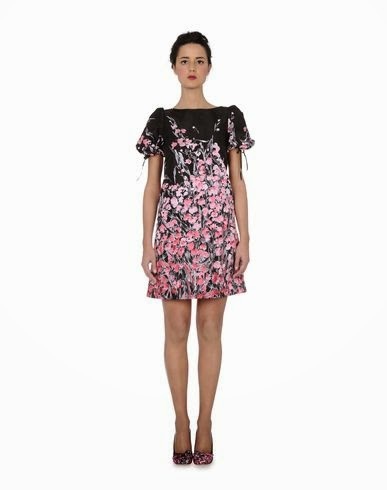 I found this beautiful NWT Red Valentino Lilly of the Valley dress, retail $695 - get it for just $100 shipped :) The only flaw I can find is that the stitching at the top of the back seam is starting to unravel, but that's an easy fix. The paper tag says it's a size 50, which is a US 12. 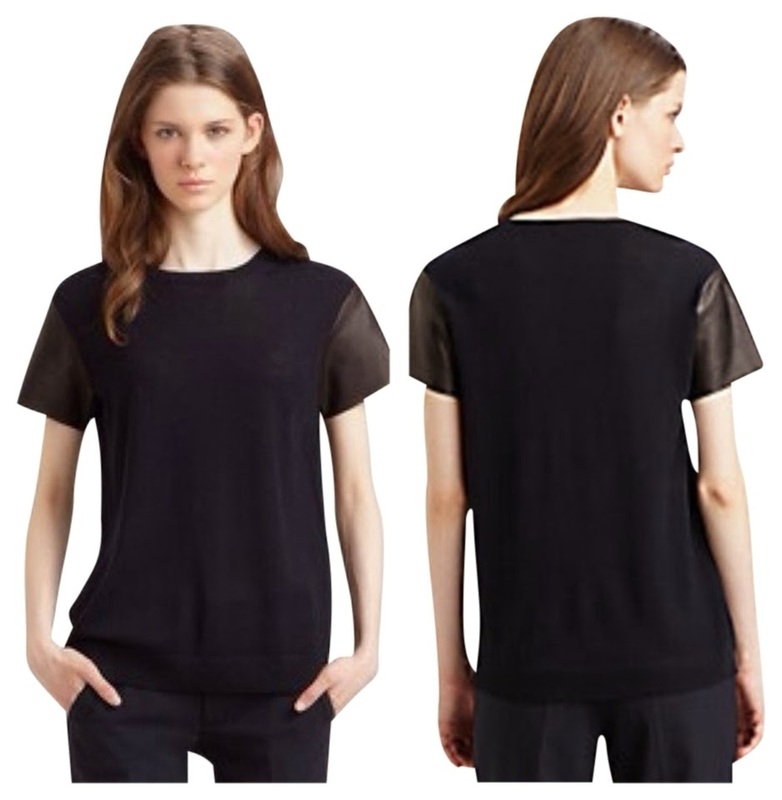 Last call on this size 2 NWT $675 Philip Lim dress! It would probably work best on a size 4 - it has a lot of stretch and a boxy cut. The patent collar is fraying a little at the edges. Asking just $80 shipped. No so dark IRL - more like the stock pics. SOLD I found these amazing NWT size 4 J Brand beige Bette textured leather pants, retail $1395. Get these for just $90 shipped!!! They do have a couple marks (see pics) but with the texture it's hard to see. Most noticeable is the tiny dot on the inner leg seam on the right leg (pic #5) - it's not a hole, but the pattern was scraped away there. 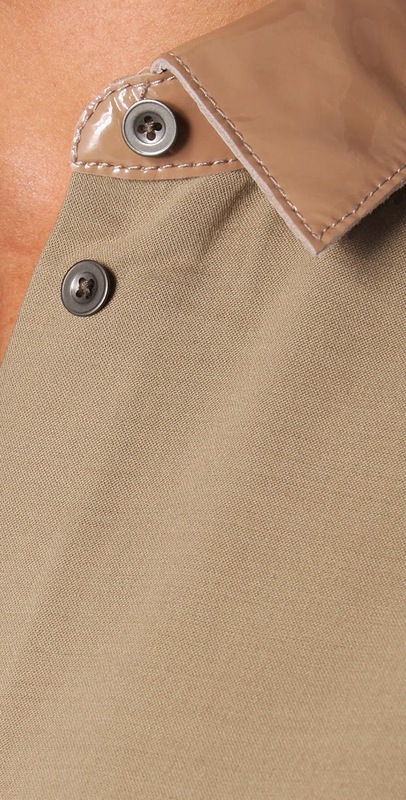 The hem is also coming undone but you can probably just glue that back together. Waistband is 13 inches across, inseam is 30 inches and hips are 14 inches across. This is a stretch leather so they are very comfortable and easy to move in. I really wish this NWT $355 size large navy Vince wool sweater with black leather sleeves was a little smaller. There is a tiny hole near the neckline (see pic - easily stitched up) and a few teeny tiny pulls - not noticeable when worn. Measures 24 inches long, 17.75 inches across the bust under the arms. Get mine for just $46 shipped. Last but not least are these NWT $395 size 2 St. Johns Indigo denim cropped jeans. The paper tag reads that the style is Emma but they look different than the Emmas I'm finding online. They are a dark denim with stretch, not too heavy, with beautiful gold stitching and details. They measure 14 inches across at the waist, 17 inches across at the hip, and a 28 inch inseam. Asking just $46 shipped.